As a parent, you often take on the role of teacher. Whether it’s how to throw a football, proper dinner etiquette, or the right way to handle conflict, you lead lessons that shape your child’s knowledge base and experiences. Don’t let your child find themselves in a position where they lack the necessary knowledge to make responsible financial decisions. No parent wants to see their child limited by debt or stressed by money problems. With your help and guidance, your child can enter into adulthood with the financial freedom they deserve. 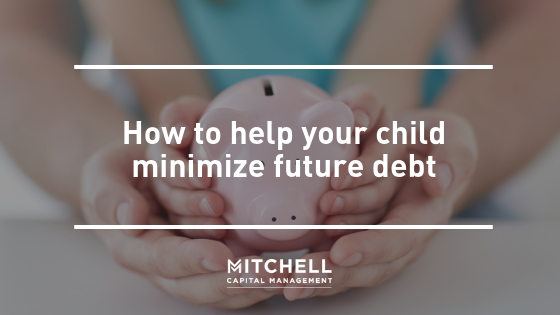 If you and your family are in a comfortable place regarding debt, have had the opportunity to build up savings for retirement, and have created a healthy emergency fund, putting aside money for your child’s education can be a beneficial way to plan for their future. It’s never too early to start planning for your child’s future and helping them out with a large expense such as education. A part-time job can offer your teen a multitude of benefits including learned responsibility, résumé experience, and of course, a paycheck. The experience will provide your teen with extra funds to spend on personal expenses and will give your kid the opportunity to build up their own savings that they can apply to future items. Be a role model for your child when it comes to spending money. Be transparent about the role of credit cards and how irresponsible spending can affect an individual’s financial future. Plan for large purchases, hunt for the best price, and prioritize needs over wants. Making thoughtful, rather than compulsive purchases, will display healthy money management habits that your child can take with them into adulthood. Expenses can pile up fast, therefore it’s essential to know the purpose of every dollar and have a plan in place. Assist your teen with creating their own budget which can help them to visualize where the majority of their money is being spent. If they really want that new pair of shoes, they can adjust their budget to fit in the added expense. Knowledge is power. Don’t let your teen head into adulthood without the proper tools to be successful with their finances. Explain what a credit score is, tell them about interest, and dissect the process of lending and borrowing. Clarify any questions they might have in order to think smartly about their finances. If you don’t feel like you are the expert opinion that your child should be listening to, provide resources such as books, and recommend tutorials or YouTube videos that demonstrate the topic in a succinct and accurate way. Your child doesn’t need to start investing but it’s beneficial to share with them investments you have made and elaborate on the benefits of smart investing. The more they know, the better equipped they will be to make their financial decisions independently. Encourage your child to take a college class about investing, as the material will be useful to him or her for years to come. Set your child up for money management success and help them to avoid a future of financial stress. Through conversation and guidance, you can help your young adult live a life without the burden of debt.